While the football world is focused on the players being sold by Monaco, Alex Lynch has a look at how they’re sticking to their prudent transfer policy. When Monaco beat Manchester City and Borussia Dortmund en route to the Champions League semi finals, it was inevitable that their impressive core of young superstars was going to get broken up this summer. Bernardo Silva and Benjamin Mendy have already moved to Manchester City and Tiemoue Bakayoko has made his way to Chelsea. Thomas Lemar has been heavily linked with a move to Arsenal and Mbappe might become the world’s most expensive player. None of these developments are surprising, but despite being set to lose more than 100 million euros worth of talent, Monaco are still having a good transfer window. This is because they have stuck to their philosophy of giving talented youngsters a chance to become world class stars. All of the recognizable faces from Monaco’s team last season weren’t always the burgeoning world stars that they appeared to be, as most of them were fairly cheap young talents when they arrived to the Stade Louis. Bakayoko was one of the Monaco’s best signings, as the Frenchman only cost 8 million Euros back in 2014 when he was bought from Stade Rennais. The same can be said about Silva, who only cost 15.75 million Euros when he went arrived from Benfica. After starring in the 2015 under 21 European Championship, a lot of people thought that Monaco got Silva at a bargain price, which turned out to be the case. Besides these two, Lemar cost a grand total of 4 million Euros from Caen back in 2015, and Mendy cost only 13 million from Marseille. Buying these top players for meager fees applies to almost the entire Monaco squad, and the success that this transfer philosophy has brought them has been undeniable. That’s why they’ve continued to make these kind of transfer moves, as they’ve already brought in some talented players this summer. The first signing they made was bringing in Anderlecht sensation Youri Tielemans, who has been one of the top prospects in world Football for quite some time. The Belgian finally has his breakout season this past year, as he scored 13 goals and provided 8 assists from central midfield in the Belgian top flight for his old club. Considering that Tielemans is already a senior international for his country, he made 139 appearances for Anderlecht despite being only 20 years old, and he played well enough to make the Europa League team of the season. The 25 million Monaco paid for him looks like a great deal. The other young player Monaco brought in is Feyenoord star Terence Kongolo, who was one of the most promising prospects in the Eredivisie. The 23 year old is already a full Dutch international, and he was a key cog in Feyenoord’s title winning side this past season. Despite the fact that he was played out of position at left back, Kongolo averaged over two tackles per game even though Feyenoord dominated a lot of the games they played in. Furthermore, Kongolo is a very experienced player for his age, as the defender registered over 100 appearances for Feyenoord even with some of the injuries he suffered. Dutch football website football-oranje described the signing as a “steal for a player who carries potential to one day be uttered in the same breath as Kylian Mbappe, Thomas Lemar and Tiemoue Bakayoko”. Just like the Tielemans buy, signing Kongolo looks like a really good deal for Monaco. In addition to Kongolo and Tielemans, Monaco have also splashed around 8 million Euros for defensive midfielder Soualiho Meite, from Lille after being on loan to Zulte Waregem in Belgium. The Frenchman is 23 years old and he stands at 6’2, while he is a strong, composed and physical presence in the middle of the park. He looks to be Monaco’s replacement for the departed Bakayoko even though he failed to crack into the team at Lille, but after 33 games in Belgium that allowed him to develop he could be a bargain. The former France U-20 player has a lot of talent, and Monaco allegedly beat a number of English sides to his signature. While this move wasn’t the headline grabber that the other two were, Meite will certainly be a player to watch this season. Besides the new players they have brought in, Monaco also have several talented youngsters returning to the team this season after productive loan spells with other clubs. One of these players is winger Allan Saint-Maximin, who played 29 games for Bastia last season scoring 3 goals. The Frenchman is only 20 and has a lot of potential to grow and develop after the positive steps forward he made with Bastia last season. Besides Saint-Maximin, 19 year old winger Gil Dias also displayed his talent while on loan. During his loan spell with Portuguese side Rio Ave, the wide man scored 6 goals while adding 4 assists. All of these arrivals display that Monaco are committed to the transfer philosophy that has worked out incredibly well for them, which sees them buy talented players from smaller clubs for decent sums of money but not outrageous figures. The smaller clubs, such as Anderlecht, take the money because it’s a windfall for them, while Monaco get a player who has potential to be worth triple the fee. Their philosophy is admirable with all of the development that the club does with these young players. For some, they loan them out and then let them become first team regulars, while other players go right into the team. Either way, the club gets as much out of these youngsters as they can, before they have to sell them to top clubs, which was the case with Silva and Bakayoko. The fact that Monaco are making this philosophy look very easy is admirable, and shows how well run the club has become. The even more telling part of this method is that not too long ago, Monaco were big spenders, as expensive stars Radamel Falcao and Joao Moutinho are still with the club. 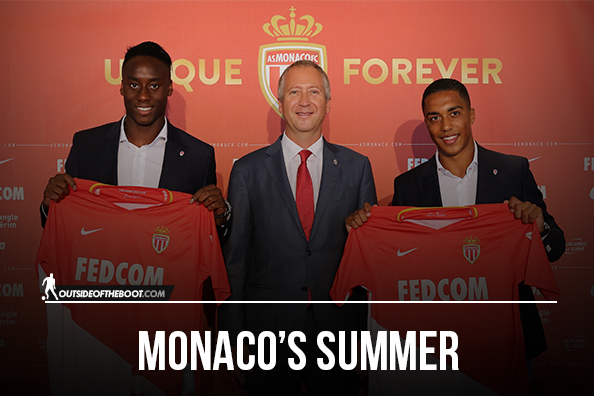 Even though those free spending days aren’t coming back anytime soon, Monaco’s buys should still catch the eye of world football, because in two years the prospects they buy could be some of the world’s best.